Find out how many Americans would splurge on a vacation or new wardrobe. It's everybody's favorite daydream: coming into unexpected money and squandering it all away on fun. It's one reason why the lottery is so popular. 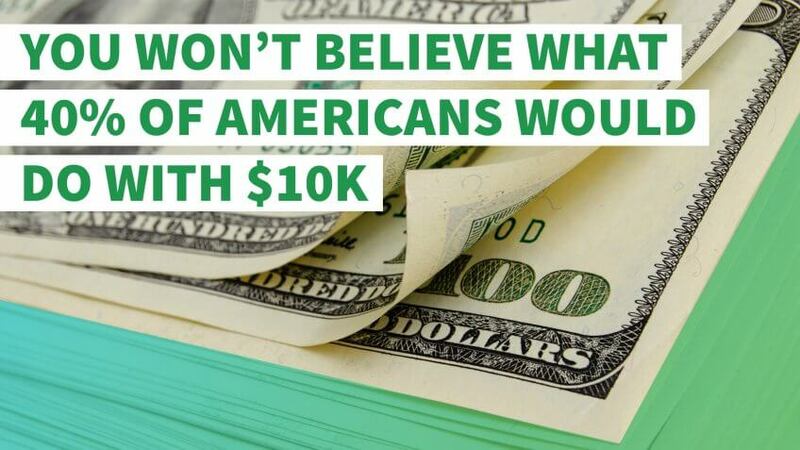 But, what would the average American do with a small but solid pot of extra money? Would they indulge themselves with travel to an exotic island or invest it? Here's a look at all the ways people would spend money from windfall. If you think Americans are good at stashing away money for a rainy day — think again. A GOBankingRates study on savings found the majority of Americans don't have more than $1,000 put away for a rainy day. Yet, a whopping 38 percent of people taking part in this survey would take a $10,000 windfall and put it directly into savings. Interestingly, 40 percent of women vowed to put their money into savings versus 37 percent of men. Among all age groups, people aged 18 to 24 were most likely to save the money, with 44 percent selecting this option. Americans aged 45 to 52 were least likely to save the money (32 percent). 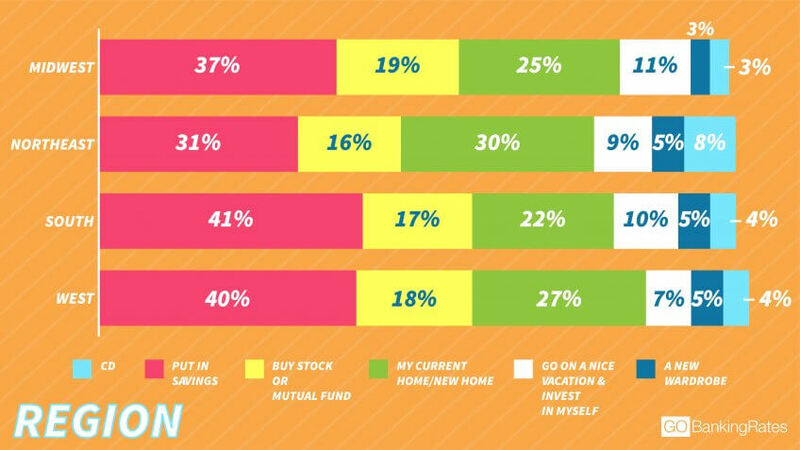 However, 27 percent of that age group said they would rather put $10,000 into their current home or a new home, and another 20 percent said they would rather invest the money — both great options for growing wealth. While having $10,000 in the bank is a great way to manage emergencies, it isn't liable to keep you from going broke in retirement. 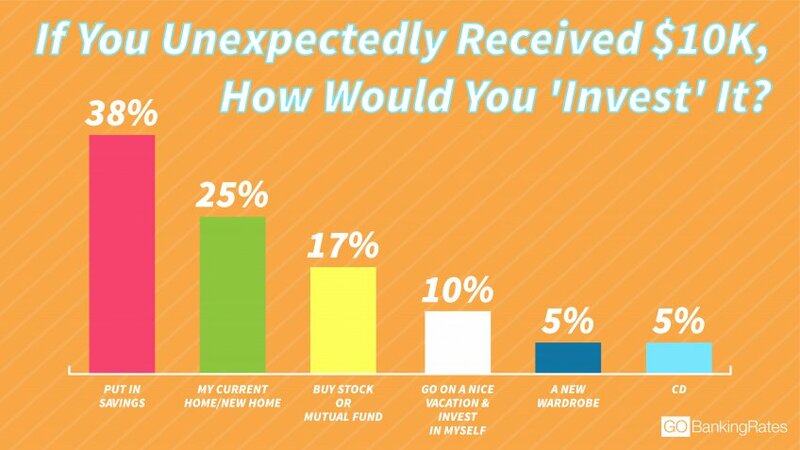 Only 17 percent of all respondents said they would invest in stocks or mutual funds, and another 5 percent said they would put the money into a certificate of deposit. This finding is striking because more than half of Americans will retire broke, according to a recent GOBankingRates survey. 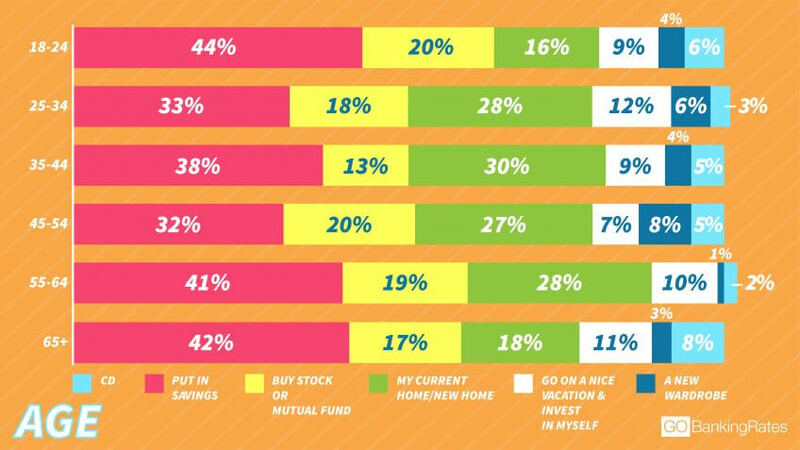 Across all age groups, respondents aged 35 to 44 were the least likely to choose to invest (13 percent), versus respondents aged 18 to 24 (20 percent) and 45 to 54 (20 percent). For younger Americans, getting ahead on retirement savings is pivotal with the uncertain future of Social Security. Even for middle-aged Americans, investing for your golden years is important, as cost of living, medical costs and emergencies can quickly erode retirement savings. Although old cliches paint women as big spenders, GOBankingRates found that only 3 percent of women would buy a new wardrobe. Compare that to 6 percent of men who selected the option. Meanwhile, people aged 45 to 54 were most likely (8 percent) to spend on a new wardrobe than any other age group. Those aged 25 to 34 were the next likely (6 percent) to splurge on new clothes. Respondents aged 65 and older were the least likely (1 percent). Although a small number of people — 5 percent of all respondents — said they would splurge on clothes, a willingness to spend so extravagantly on a wardrobe is a sign of poor spending habits. Rather than invest in clothes, put any windfall you receive toward your future. Homeownership has always been part of the American dream. But with rising housing costs, some Americans feel the cost of owning a home compared to renting just isn't worth the investment. Still, one out of four people GOBankingRates surveyed said they would invest $10,000 in their existing home or a new home. The results varied depending on geographic location. Thirty percent of respondents in the Northeast chose this option, compared to 22 percent of those in the South. 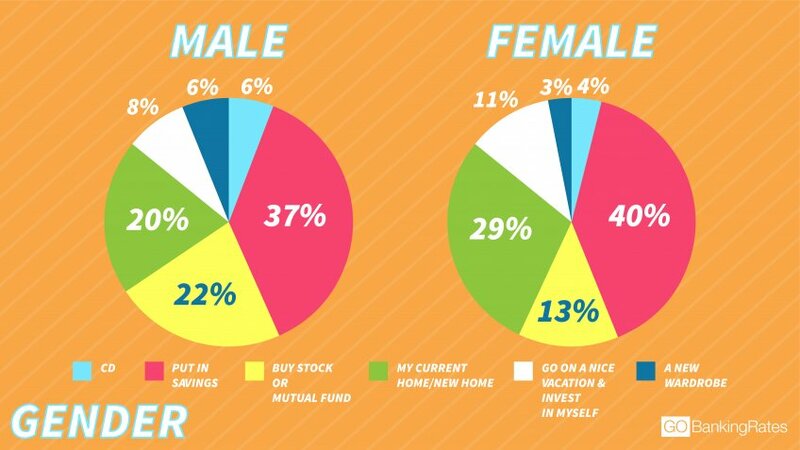 Women were far more likely (29 percent) to invest in homeownership compared to men (20 percent). Meanwhile, Americans aged 35 to 44 were most likely to choose this option (30 percent) compared to all other age groups. Respondents aged 18 to 24 were least likely to invest in homeownership, with just 16 percent choosing the option. A 2017 survey by AAA found that 42 percent of Americans plan to vacation this year. But if people are looking to book travel plans this year, few would be willing to drop $10,000 on the affair. GOBankingRates found only one in 10 people would spend a $10,000 windfall on a vacation or other investment into themselves. This could simply be due respondents unwilling to spend such a significant amount of money on vacationing or another investment into their well-being. Women were more likely (11 percent) than men (8 percent) to choose this option, showing they are more willing to invest in themselves. Among age groups, respondents aged 25 to 34 were most likely (12 percent) to choose this option, with people aged 45 to 54 the least likely (7 percent). However, investing in yourself — whether on a vacation or schooling — can improve your mood or career prospects. As long as you have sufficient savings set aside, don't worry about treating yourself. Just be reasonable with your spending. The best investments are not always the most glamorous. If an investment seems too good to be true — it is.